Upon platelet activation, free fatty acids are released at the stage of thrombus formation, but their effects on fibrin formation are largely unexplored. Our objective was to characterize the kinetic effects of fatty acids on thrombin activity, as well as the structural and mechanical properties of the resultant fibrin clots. Thrombin activity on fibrinogen was followed by turbidimetry and detailed kinetic characterization was performed using a fluorogenic short peptide substrate. The viscoelastic properties of fibrin were measured with rotatory oscillation rheometer, whereas its structure was analyzed with scanning electron microscopy (SEM). In turbidimetric assays of fibrin generation, oleate and stearate at physiologically relevant concentrations (60�0 μM) produced a bell-shaped inhibitory dose response, increasing 10- to 30-fold the time to half-maximal clotting. Oleate inhibited thrombin activity on a short peptide substrate according to a mixed-type inhibitor pattern (a 9-fold increase of the Michaelis constant, Km and a 20% decrease of the catalytic constant), whereas stearate resulted in only a minor (15%) drop in the catalytic constant without any change in the Km. Morphometric analysis of SEM images showed a 73% increase in the median fiber diameter in the presence of stearate and a 20% decrease in the presence of oleate. Concerning the viscoelastic parameters of the clots, storage and loss moduli, maximal viscosity and critical shear stress decreased by 32�% in the presence of oleate or stearate, but loss tangent did not change indicating decreased rigidity, higher deformability and decreased internal resistance to shear stress. 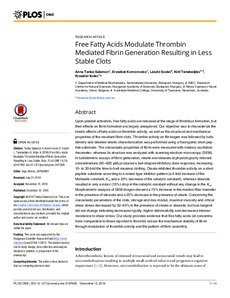 Our study provides evidence that free fatty acids (at concentrations comparable to those reported in thrombi) reduce the mechanical stability of fibrin through modulation of thrombin activity and the pattern of fibrin assembly.